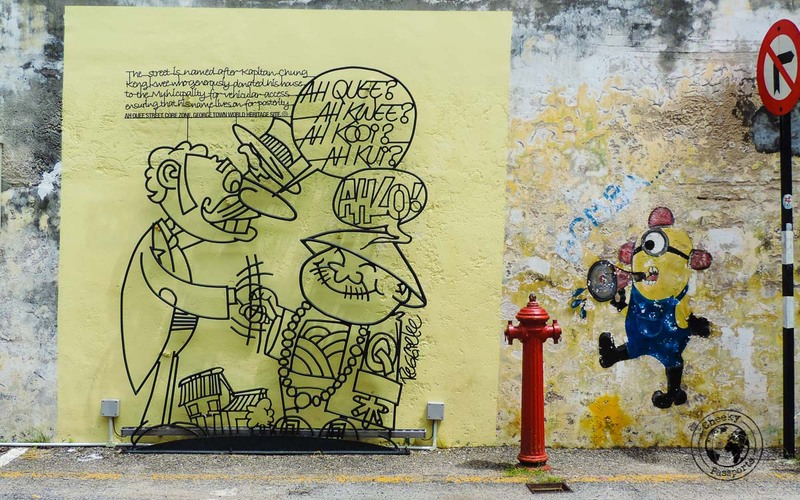 The street art in Penang consisting of amusing wrought iron caricatures and tastefully painted murals have added much-needed depth, colour and humour to the town’s little streets and alleyways. 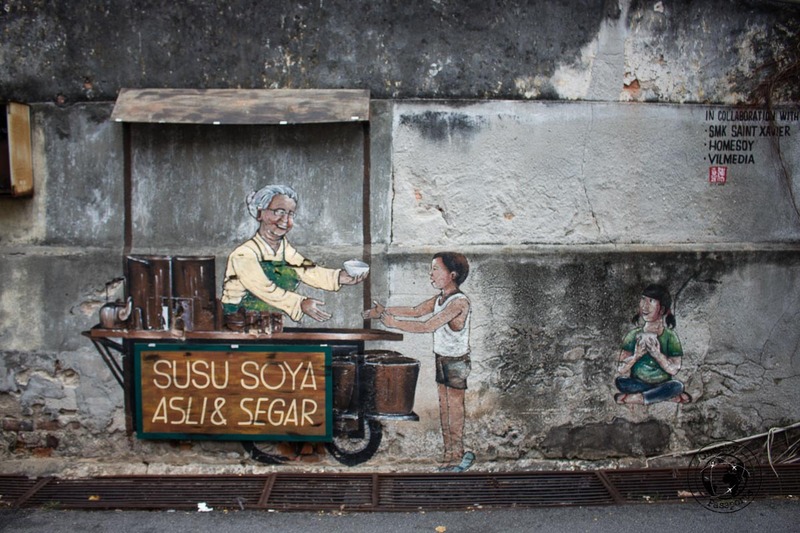 When I had first visited Georgetown, Penang’s famous heritage city, almost a decade ago, I was rather disappointed with what I felt was a cold, crumbling town giving in to urban decay with no signs of revival. Sure, the street food and restaurants were great, as were the colonial buildings showcasing some of the town’s rich history, but I also remember feeling that the town was a little boring and seriously lacking some form of vivacity. Fast-forward to 2017, my second visit to Malaysia. I tried convincing Nikki that we should skip Georgetown and move on to the beaches instead, but he did a great job of ignoring me. Admittedly, this time it served a purpose as, to my surprise, the town had been revamped. 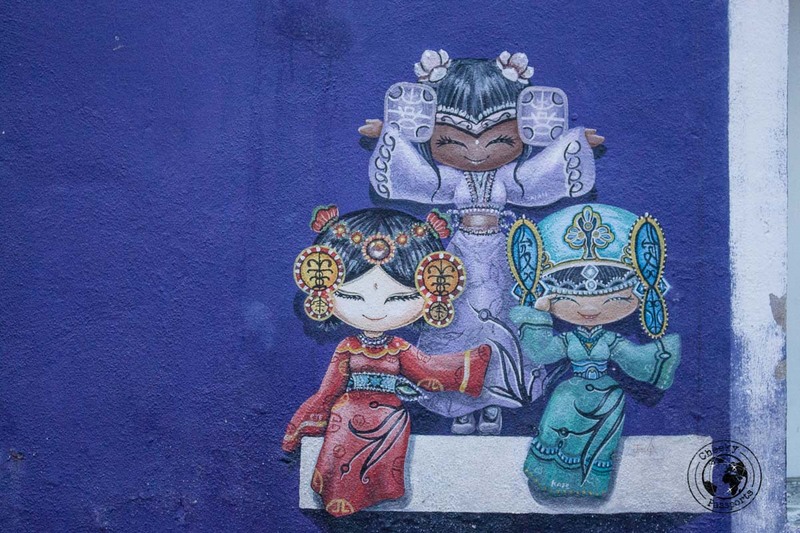 The street art in Penang is also purposeful as it subtly conveys snippets of historical information, thus helping the passers-by understand Georgetown’s history and heritage better. 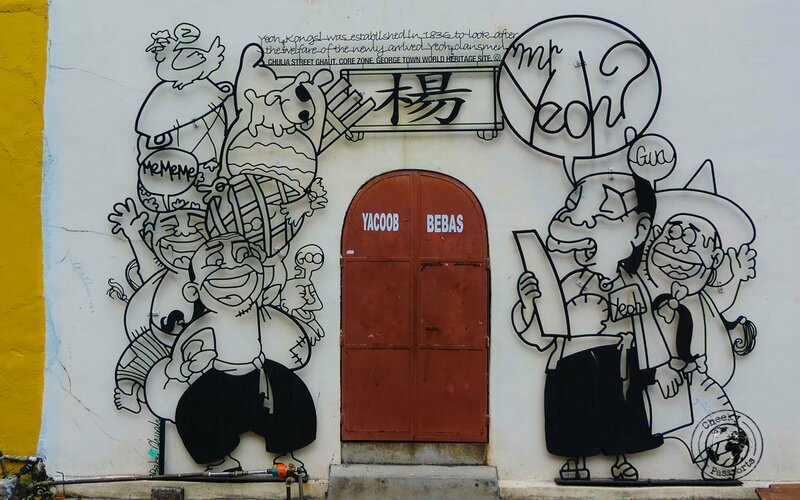 Here’s a look at some of the best street art in Penang. Having trouble booking internal flights in Malaysia? Try using Kiwi or Nusatrip! 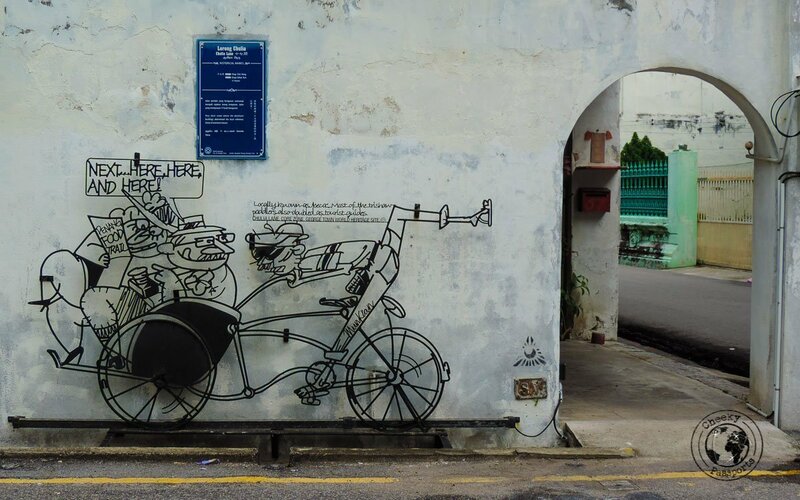 These metal sculptures have furnished Penang’s street walls with some very welcome humour. 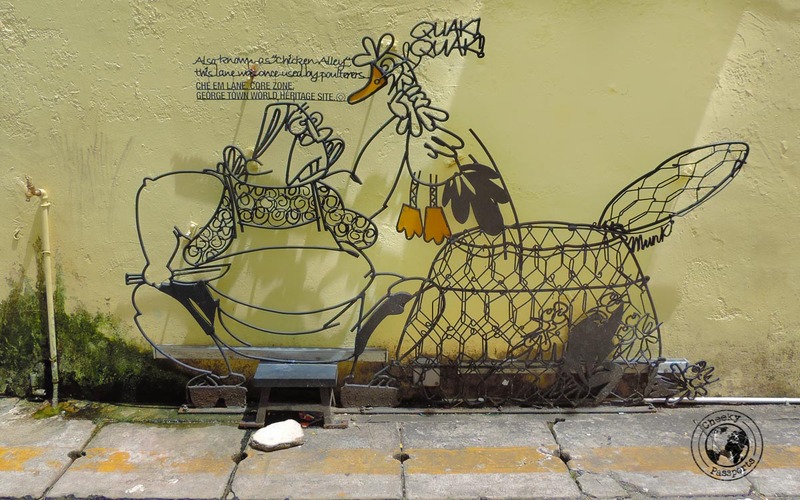 For example, a sculpture depicting a large woman throwing a chicken in a cooking pot in Che Em Lane informed us that the lane was also known as Chicken Alley since it was once used by poulterers. 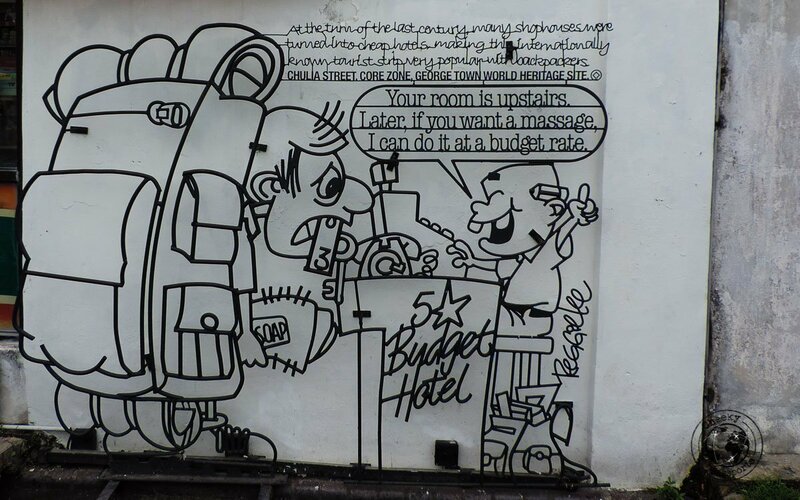 Another sculpture shows a heavily laden ragged backpacker checking into a “5 star budget hotel” in Love Lane, highlighting the fact that at the turn of the century many shophouses were converted into cheap hotels thus making Love Lane very popular with backpackers. 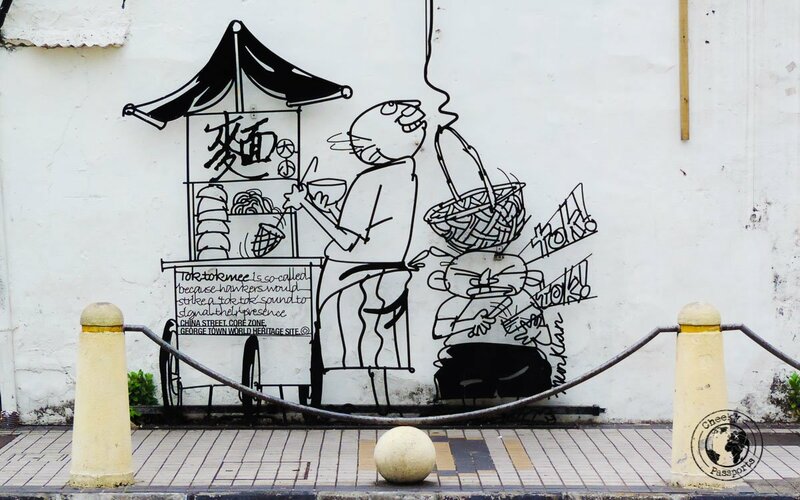 The sculptures, which are part of the street art in Penang, can be found all over town and you can even obtain pamphlets showing the location of each of the 52 sculptures. We felt that it was a lot more fun to walk around the town and simply come across them spontaneously! 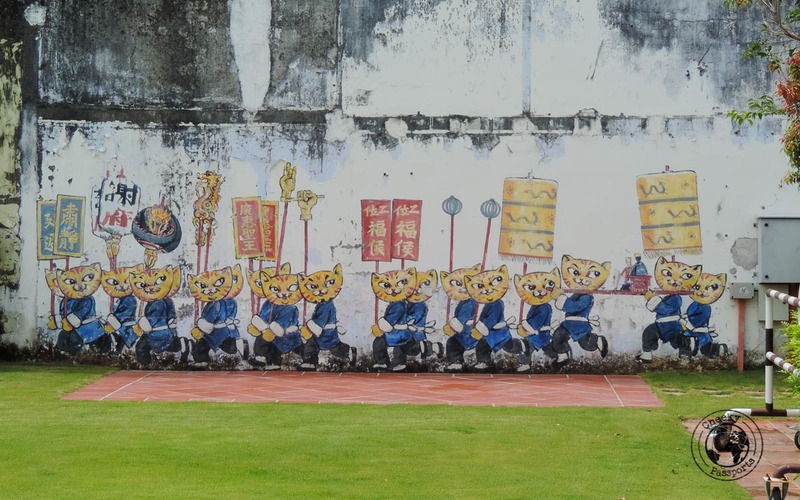 The sculptures were commissioned by the Penang State Government in 2009 after an international competition aimed at artistically celebrating Georgetown’s status as a UNESCO World Heritage Site was held. 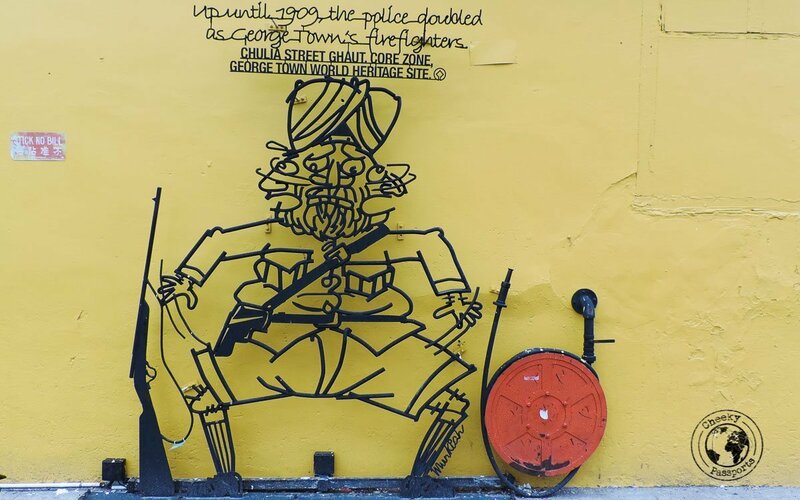 The Malaysian sculpture studio SCULPTUREATWORK won the contract and consequently placed the playful and funny caricatures all over town in a very clever and informative manner, whilst respecting the town’s newly-acquired heritage title. 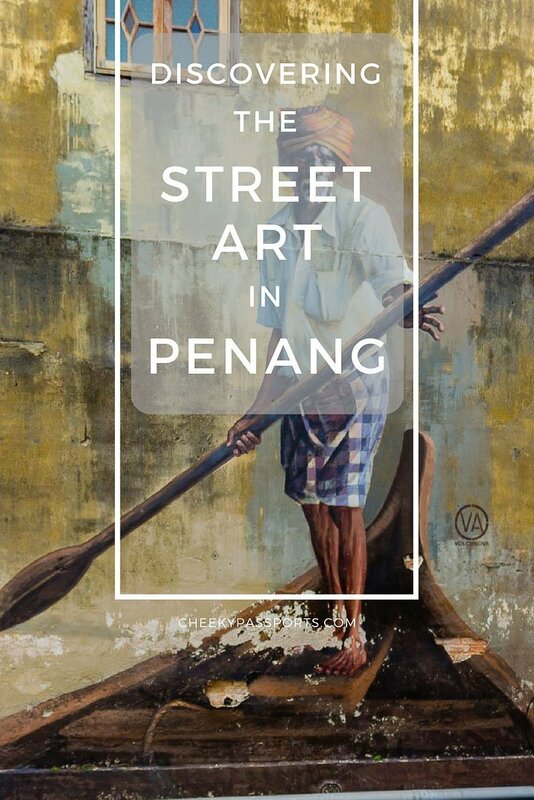 Street art in Penang has been around since 2011 imparting a sorely-needed breath of fresh air to the town. 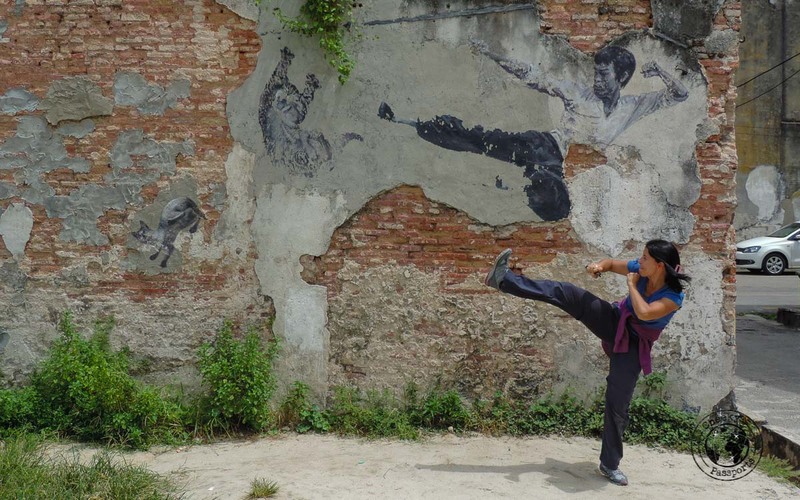 Giant cats, the expressive Indian Boatman, Kung Fu Girl and Bruce Lee can all be found gracing Georgetown’s colonial walls. Although they do not impart any historical facts to the city, as do the wrought iron caricatures, they complement Georgetown’s character beautifully, not only lending colour to the streets, but this time also highlighting the local urban spirit, although this is very much open to individual interpretation. 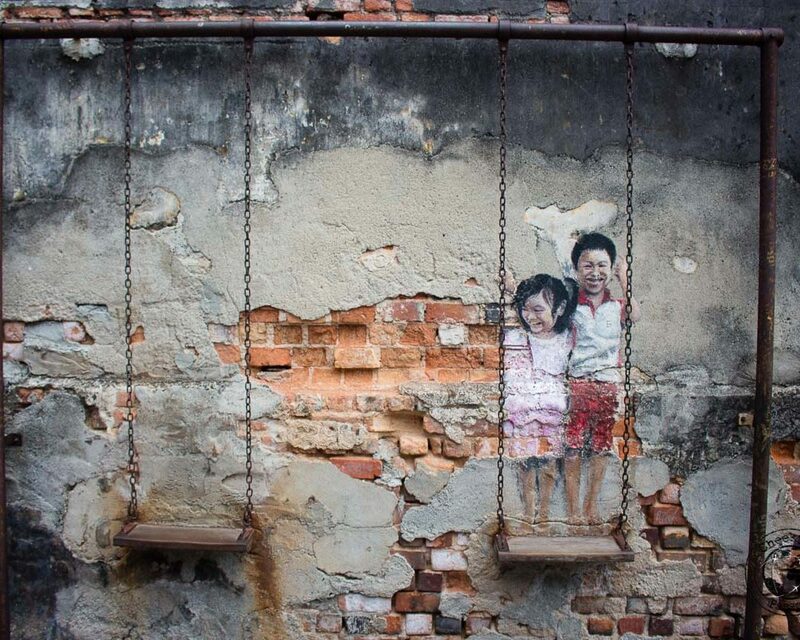 The better-known pieces of street art in Penang are those painted by Lithuanian artist Ernest Zacharevic. Additional murals from other artists have since sprouted up all over Georgetown, marking a trail which is fun to follow. 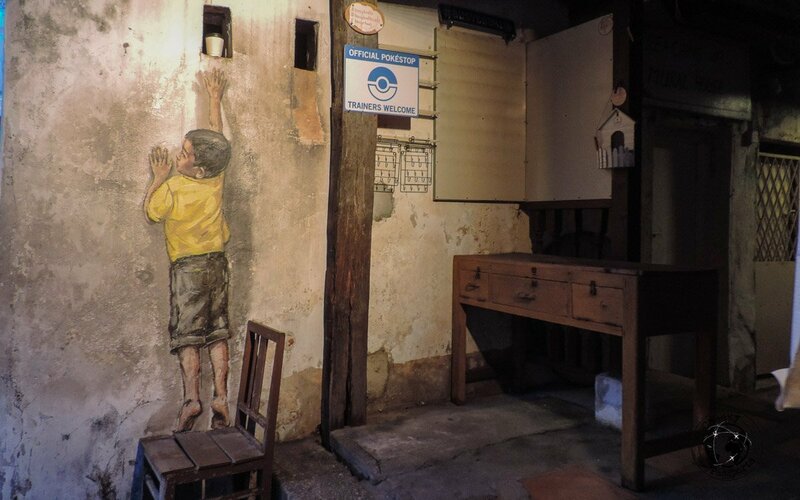 Again, we preferred to stumble upon them randomly during our many walks in the town’s historical core. 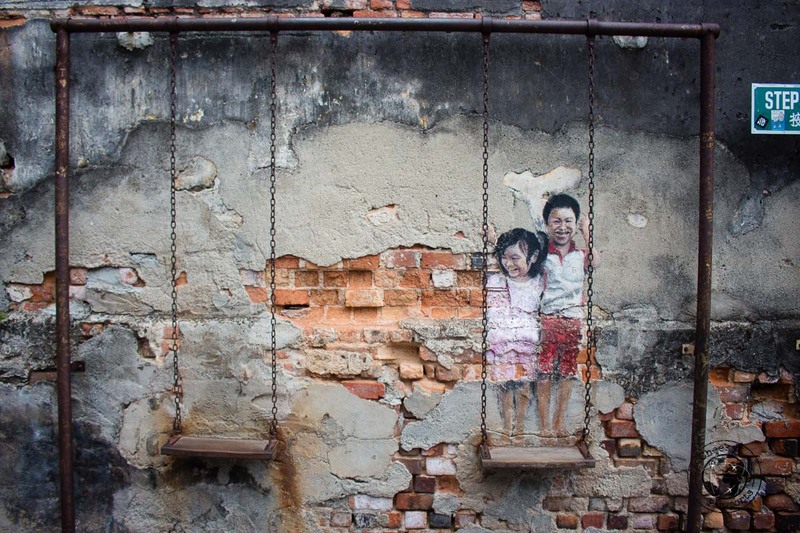 Many of the individual pieces of street art in Penang have a connection to the actual street whose walls they are painted on. 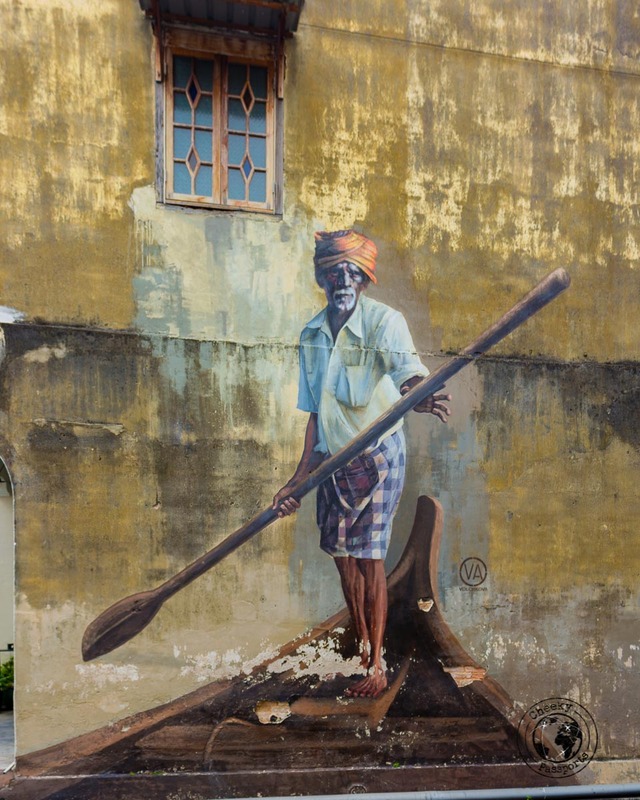 For example, the Giant Chicken is painted in Chicken Alley, the Indian Boatman can be found painted on a property in Stewart Lane – a narrow branch of this lane was also known as Boat Alley. 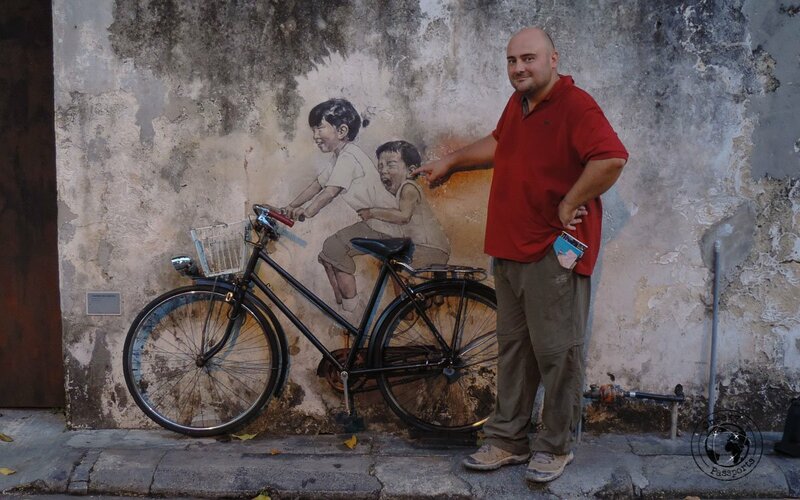 Other murals are interactive, 3D art if you wish, being painted around props which can be used by passers-by thus making for a whimsical photo. 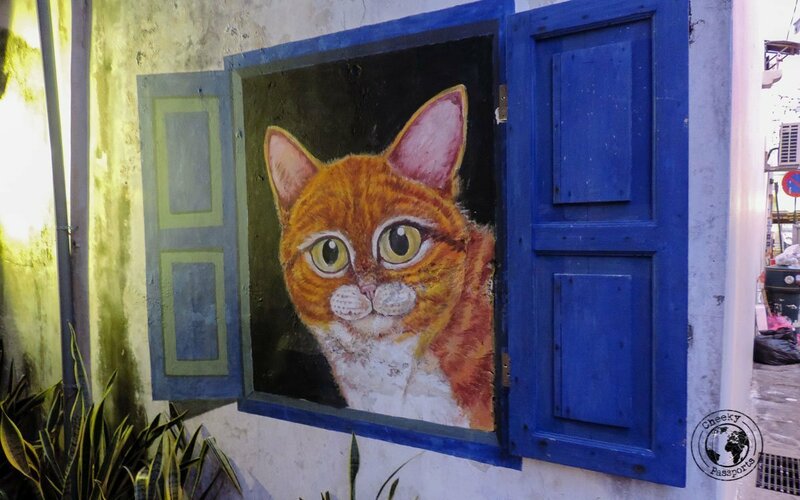 Lovers of the feline species will enjoy hunting down quirky cat murals here as the street art in Penang includes a LOT of cats! On a completely unrelated note, Georgetown is also home to a Cat Café called Purrfect Cat Café where you can play with cats to your heart’s content as you sip your coffee. We did not actually try it so I cannot recommend it, but I thought that it was worth mentioning since coffee and cats sound like a great combo to me! In conclusion, perhaps for the first time in my life, I am glad to have had Nikki put his foot down when I suggested skipping Georgetown (he’s quick to point out that it happens more often than I care to admit)! 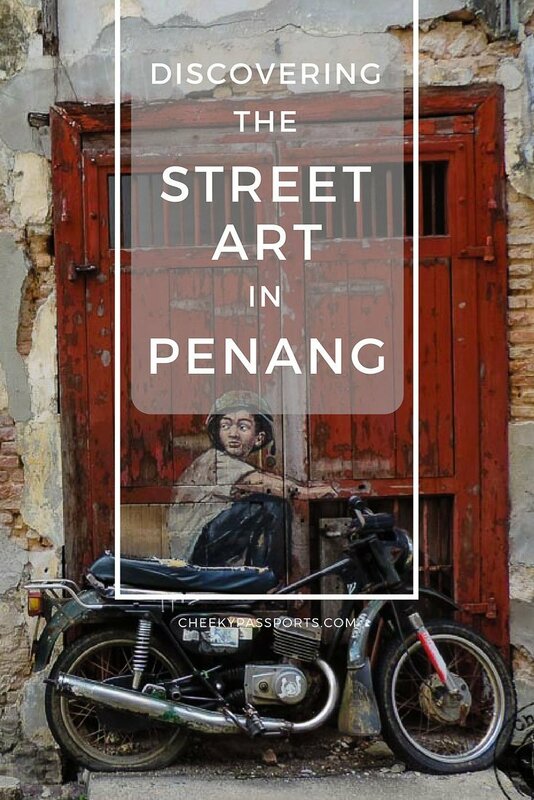 The street art in Penang has genuinely provided the town with a new lease on life and I was happy to discover that some of the spots I remembered from my previous visit, had flourished into artsy, contemporary fun places, thus contributing to firmly placing Georgetown in my list of favourite destinations in Malaysia.